Today’s ominous warnings about a possible derecho, severe thunderstorms, and winds up to 70 miles per hour led many in the Midwest and Northeast to seal themselves up in their homes and cover everything they own in masking tape. Thankfully, New York and the surrounding areas haven’t been wiped off the map. A tornado touched down in Elmira, New York, damaging some buildings, but there were no immediate injury reports. USA Today reports that at least 300,000 homes and businesses have lost power, and hundreds of flights were canceled. 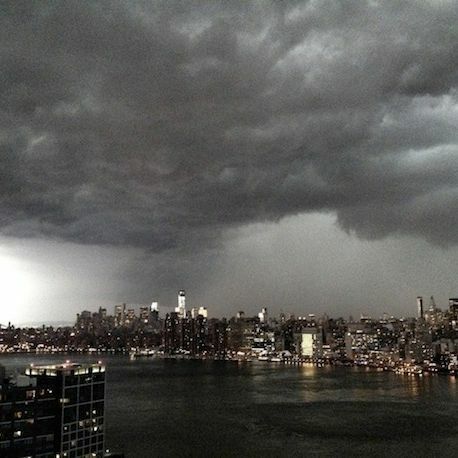 At 8:30 p.m. the severe thunderstorm warning was canceled for Manhattan. Damage reports are still coming in, but it seems most New Yorkers safely rode out the storm while snapping photos of Ghostbusters-like clouds over the city and posting them on Twitter and Instagram. Here’s a look at the work of those who were brave enough to stand near their windows. Update: As of 11 p.m., more than 100,000 people were still in the dark in Pennsylvania, along with tens of thousands of people in Ohio. At a press conference, Governor Andrew Cuomo said nearly 95,000 New York residents were without power as well. According to CNN, another tornado was reported in Brookville, Pennsylvania, while downed trees trapped people inside a home in Bromme County, New York, and shut down the Metro North commuter rail north of Chappaqua, New York. Fortunately, there are still no reports of injuries or fatalities. Update 2: The storm has claimed the life one man. Richard Schwartz, a prosecutor with the state attorney general’s office, was killed when lightning struck the steeple of Christ Church in Cobble Hill, Brooklyn. Schwartz was headed home around 8 p.m. when the lightning caused scaffolding to collapse on him.